Nearly two weeks ago, we decided it was time to foster another greyhound! It is nearly 12 months since our beautiful old girl April went to the Rainbow Bridge and we felt it was time to help another dog in need of saving from the cruelty of the racing industry. The rescue group we’re involved with – Amazing Greys – had 5 on the books needing a foster home. So we asked if there was a female available (Rupie seems to like the girls best) and there was – a lovely fawn girl called – Crazy! Oh dear. Did her name reflect her personality? We had agonized over the decision to bring another dog into the house – we have a lovely balance and friendship with Rupie and Billie. Everything is calm and organised and routine. What would a dog called Crazy do to that harmony? We were assured her name wasn’t an indication of her personality (an ironic name, perhaps?) so we said we’d foster her, as long as we could change her name. After all, what young lady wants to be called Crazy? So we re-named her Chelsea. Less than a week later, after picking her up from a road transport, she arrived! She was quite anxious and excitable, but she’d had at least a 10 hour road trip in a small dog trailer so it was no wonder. After initial introductions, all seemed well, although Chelsea was quite full on and in Billie and Rupie’s faces. They gave her a few grumbles and she turned the other cheek, not retaliating, so that was a good sign. She is very thin so we’re fattening her up with some good dry kibble and puppy food. Very quickly she proved to be friendly and affectionate and she settled into home life very quickly. She is a quirky girl who loves to ‘roach’ with her back legs up the wall. She wiggles and wiggles and her tail never stops. It’s like a whip though and poor little Rupie is just the wrong height and cops it in the face! In the past two weeks, Chelsea has grown in confidence and is in fact very pushy for affection, and quite crazy at times!! 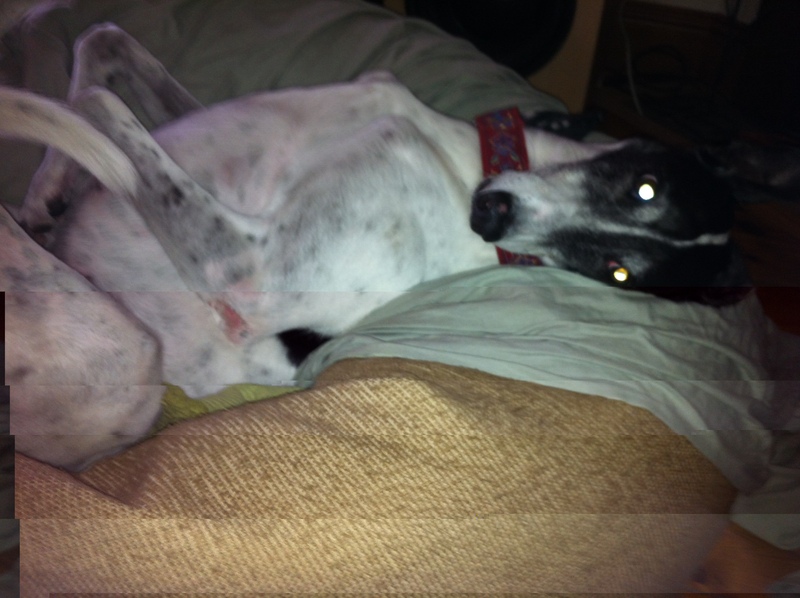 So, it appears her name was not ironic – she is the most enthusiastic greyhound I have ever met. She can be hard work, and goes CRAZY when she sees a cat on our walks, but she is funny and cuddly and loves to follow us around. She’s very easy going with Billie and Rupie and I think they’ve actually come to quite like her, even when she’s standing all over them! We have foster failed in the past (ie. ending up adopting them) but we’ll have to think very hard about this young lady. We love her and she’s wormed her way in, but it certainly has changed the peace and quiet of our home! Perhaps when she’s had more time to settle, there may be a suitable home for her with energetic children she can play with! Here are some photos of the beautiful Chelsea and her new friends! They belie everything I’ve said about her being full of beans – but she does also love to flop down and relax! Categories: General, Welfare Campaigns | Tags: adoption, animal rescue, foster carer, Fostering, greyhounds | Permalink. A short little update after a few more days of settling in. Billie is continuing to feel more comfortable with her environment and with us. She is completely comfortable around April and Rupie too; more so with April, as greys really do have a connection with each other. Rupie is good with her as long as there’s not too much horsing around, or he gets a bit jealous and over excited. But April and Billie will walk around the house together, have a little play dance and even step over and around each other when they’re lazing about. No grumbles, just complete acceptance. She’s happy to lie in her cuddler quietly while we’re relaxing at home or watching the TV, but as soon as we get up to go to another room, we have a blue shadow following us. We find it unnerving sometimes as we’re used to light colours dogs around the house (April is nearly fluorescent white) and then suddenly we realise Billie the Shadow is in the same room! She comes up to us when we ask her to and loves having a scratch under the chin or behind her ears and is quite happy to stand next to us while we give her a good rub or cuddle. Mike has been at home all day with them today and she’s now coming up to him too, so progress indeed is being made. She’s nervous of unusual noises, which is not surprising, but is also inquisitive and likes to check out everything in the house. Billie is eating well, and we’ve established a nice little routine of who gets fed when. Now we’ve just got to get her poos a bit more normal!! Today’s walks were better than they have been. She’s been out twice for a short, ten minute stroll up and down the street (April can’t walk too far due to her club foot) and certainly seems to feel more confident when Auntie Apie is nearby. We won”t push her too far just yet, as we think she has already done amazingly well to cope with so many new things in only 4 days. 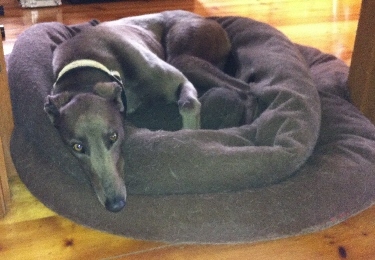 Billie is relaxing in her new comfy bed – much better than a concrete floor! It doesn’t take them long to get used to creature comforts! April is so relaxed with Billie around that she spends lots of time ‘roaching’! Categories: Short Stories, Welfare Campaigns | Tags: Billie, foster carer | Permalink.